Francisco Zuñiga is a master artist. Best known for his massive and primitive sculptures, his poignant works reveal stunning forms of powerful and dignified Mexican women. These Sculptures represent not only the timelessness of femininity but of all humanity. Zuñiga is a master not only of sculpture but of drawing and printmaking as well. His lithographs, though less known than his sculptures, have proven to be their equal in both skill and sentiment. Zuñiga’s lithographs stand alongside those of the most recognized masters, affirmed by his presence in the Mexican Master Suite. Zuñiga was one of four in this collection of Master’s works that included Siquieros, Tamayo and Cuevas. These prints serve as a witness to the Latin American peoples throughout the centuries with the point of departure invariably a female figure. Francisco Zuñiga began working in lithography in 1972 and ceased producing in this medium in 1986. 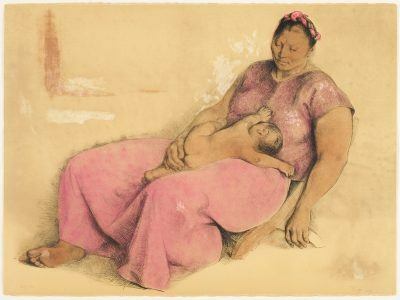 The Zuñiga exhibition at Meredith-Kelly Latin American Fine Art in February will reveal his brilliant lithographic accomplishment through an extensive collection that includes works from the Mexican Master’s Suite. Zuñiga powerful message is carried throughout his works, and these lithographs offer important insights into his total production as an artist. Zuñiga is a master of sculpture, drawing and printmaking. Zuñiga’s sculptures and lithographs are consistently sold at auction at both Sotheby’s and Christie’s and are truly collector’s works.